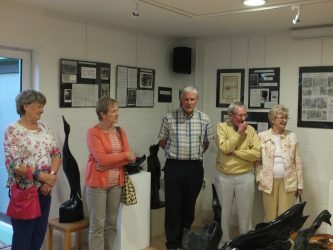 The Thomas MacDonagh Heritage Centre would like to thank the Ardcrony Woodcarvers for their inspirational, wonderfully carved pieces that were on display until last Sunday, 20 August. This was an extensive exhibition of almost fifty crafted pieces, made from either bog-oak or bog-yew. A selection of photographs by Andy Whelan were also on display. During the Winter months the wood carvers meet regularly at Paddy Spain's, in Ardcroney, and work on their exhibits under the guidance of Paradizi. This was part of the calendar of events to commemorate Thomas MacDonagh and the 1916 Rising, which continues at the Thomas MacDonagh Heritage Centre.